With Samsung's rumored delay of the Galaxy S8, the stage is set for LG to rise to the top of MWC 2017. If it plays its cards right and presents the G6, it could steal the spotlight of the whole show. The latest rumors about the device stimulate the imagination, with the potential for the 18:9 format and the pre-existing second screen technology, and could mean the South Korean manufacturer will land a big hit. The signs all point to LG, perhaps Samsung's oldest rival in the tech market. Either just before or shortly after the Mobile World Congress, the manufacturers reveal their top devices, like the Galaxy S5 vs the LG G3, Galaxy S6 vs LG G4 and the Galaxy S7 vs LG G5. In 2017, something new could happen: LG could release the top device ahead of Samsung. MWC 2017: will we see the Galaxy S8 or not? LG Display has announced an extravagant display, which The Verge says the LG G6 will come equipped with. The 5.7-inch LCD screen will have an 18:9 aspect ratio and QHD+ resolution. The Xiaomi’s Mi Mix's 17:9 screen is just above the standard 16:9, and the extra space is used for the Android software buttons. This extra screen real estate on the G6 could lead to new functionality. The 2,880 x 1,440 resolution gives the phone an extra 320 pixels along the side. That's compared to the 2,560 x 1,440 resolution of the LG G5. LG could come up with some new ways to use the display, as it has shown the ability to use space in an innovative way in the past. 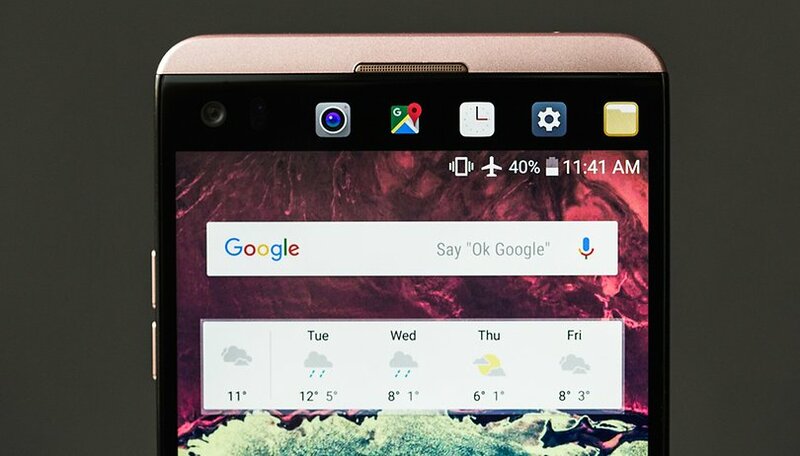 The LG V10 was the first with an Always On second screen, which was unfortunately also an IPS panel. The V20 has carried this legacy. A secondary display could fit seamlessly alongside the main display on the LG G6. To be honest, the second screen is necessary. The Always On display of the LG G5 didn't make any sense because the display was IPS rather than OLED. IPS displays don't work efficiently enough to remain on all the time, and they drain the battery, which can't be alleviated by switching to an LED backlight. For a display that is always on, OLED is a better-suited technology. It works in such a way that black pixels go unlit, while pixels that display information are lit, to save energy by not lighting all of the blank space. LG can take advantage of OLED technology, it proves this every year Las Vegas at CES. Just last week, LG presented the LG Signature W7 OLED 4K TV that was showered with praise and awards. The most recent OLED smartphones by LG were the G Flex and G Flex 2: total non-starters due to the exorbitant price, and then by LG's software department spontaneously deciding to stop providing updates for the devices. So these two became the outcasts of the brand, especially the G Flex 2 because of its robustness. With the V series, LG gives us the next piece of the puzzle. The V10 and V20 were sturdy, with huge displays and replaceable batteries. If LG could incorporate the best parts of its most innovative devices and well-loved V series, the LG G6 could be a smash hit. Do you think LG will prove itself at MWC? Is the LG G6 capable of winning over Samsung fans before the S8 comes out? Let us know what you think in the comments. How come nobody compares the Google Pixel to the new LG phones coming out? I had a G4 that I gave to my daughter when her Samsung started the death spiral. She's been using it for almost a year and a half without any issues and loves it. I regret not keeping it for myself now. Yes the infamous boot loop/frequent crashing/total shutdown due to solder bond cracking on ram chip which sits right on top of SD808. Fortunately these can be fixed just by applying solder flux and reheating the chip to around 205 C for few seconds. (need heat gun and IR thermometer). There are videos on youtube which shows some one really skillful removing ram chip and re-soldering it back on manually! But probably just solder flux + reheating should do the trick. One trick to keep your LG G4 running a bit longer is to make a 1 cm aluminum square (just fold aluminum foil several times), open up your LG G4, and place the aluminum square between the metal frame of the phone and the ram chip (the prominent big square chip in center of the motherboard). Reassemble LG G4, and it should be better behaved- this is temporary fix, but it should buy you some time. To be honest samsung is crap, yes their phones look nice and have the hardware, but overall they are just that a nice phone to look at that is fast but with the most useless client service and firmware updates. LG has already released nougat on their devices the G5, V20 et al. What device of samsung received nougat yet? Zero to be honest, not talking about the 0.0001% beta testers that received nougat. I mean look at the price of a device you pay for when purchasing a samsung device compared to a LG device. The only thing LG needs is a device that is close to the samsung note series and you will see how samsung will start to loose market share in my opinion people are by the day getting more irritated with samsung I see on other forums and news sites. To be honest if LG keeps on being so fast with firmware updates my next device will either be the V20 or G6. Yes I agree Samsung is crap these days (esp with Note 7 debacle!). Samsung has been emphasizing fashion over good engineering for quite a while with fragile glass back, useless curved display, non removable battery etc. But old Samsung phones were great. My Note 2 from way back is still trucking on despite being used continuously for four years! Note 4 was great too, but Samsung phones after Note 4 just went downhill. lg do over smart things with its phones.....samsung keeps things simple and upto mark...sorry lg cant beat samsung. after the $600 lost on the Motherboard bad soldering BOOT FAILURE disaster of the G4 I will NEVER TRUST LG AGAIN...SCREW THEM! itprolondon - do you use Samsung Pay? If you do you are the only person I have heard of that does. In my opinion pay by phone apps and systems are way to risky. Having everything from bank accounts, credit cards, and all your personal info all accessible though your phone with a wave over a reciever. Sorry not me to easily lost and or hacked. My first LG, the V20 has been rock solid and I can swap out the battery. My Note 7 was a fiasco. You clearly don't know what you're talking about. You're V20 is bug infested at best stop perpetrating a comical fraud with this LG junk. Don't give up you're day job cause it's pretty clear you are just as lost as LG. Nobody worries about anything LG makes hence it's poor financial standing revenue wise and market share wise. The LG G2 was the best smartphone I ever owned. I bought a G5 over the summer and have been less than impressed by it, especially compared to the G2. LG could potentially recover with a great new device; maybe the G6 is it, maybe it isn't, we'll find out soon. Need we be reminded that LG didn't release any exploding devices? LG actually makes decent and innovative products - they aren't shy to try something new. The edgeless display of the Samsung Galaxy S6 was so gimmicky it was laughable. Even my die hard Samsung friends told me quite candidly that it served no real purpose other than looking cool. If anything it was perhaps a slight annoyance since it made the phone difficult to hold on to if you didn't use a case; speaking of cases, the edgeless display was even more useless if you used a case. The second display on the V10 actually served a purpose and was useful beyond simply looking cool. At least Samsung is finally improving overall build quality - the S6 actually felt like it might be worth the enormous price tag Samsung puts on it. Samsung is only popular because they keep trying to rip off Apple in little design ways early on in the device wars. Most companies will model products after other, well established products. This is nothing new. Only Samsung just spams the market and then deals with the legal repercussions later (not to mention threatening and bribing customers to remain quiet about their mishaps, or just flat out denying them). Samsung will release five phones a quarter it seems, mostly mid range devices, one or two low end devices, and one or two high end or flagship devices. They sell well because their manufacturing processes and materials used are cheap, so they are able to sell their mid to low range devices for cheaper as well. The reason why Samsung is so popular is simply because they're everywhere, and they do dominate the mid to low end device range simply because of the volume of models they release. Samsung's Android UI is god-awful, it's the main reason I've always stayed away from their devices. I would suggest you keep your day job as well, if you have one, and find a free grammar lesson online somewhere for Christ's sake. The difference between "your" and "you're" is so simple they actually teach it to children nowadays (imagine that, right?). Trying to prop up LG won't help. They are revenue wise and market share wise pretty much useless on the Android platform period. Everyone knows all LG really is turns out to be a bootleg wannabe Samsung company with poor software and useless design elements. LG can out with it's G6 in March and Samsung can release the S8Edge and S8EdgePlus in April and Samsung will still sell 10 times what LG sells in the first two weeks. Anyone buying anything LG makes is definitely silly. Considering your username is 'Note5isboss', you are nothing but a Samsung fanboy. You can't see past your bias on how great LG is. They still have removable batteries and IR blasters, features Samsung ditched years ago, 'cause potatoes. LG also tries new things, such as having a phone with 2 screens, or having a modular phone. Samsung plays it safe, copying trends already proven successful (such as dual cameras, which LG helped prove).